Aizawl FC earned bragging rights as they defeated Shillong Lajong FC 2-1 in the North East Derby, played at Rajiv Gandhi sadium, Aizawl in Round 3 encounter of Hero I-League. Lalrutthara opened the scoring for the Mizoram Reds in the 32nd minute with Jayesh Rane doubling it just minutes into the hour mark. Lajong's Japanese midfielder, Yuta Kinowaki reduced the lead in the 85th minute with a penalty kick. Khalid Jamil made changes to the team that played against Minerva Punjab FC, while Thongboi Singto made two changes in Shillong Lajong's playing XI. Sandeep Singh came in place of Romanian, Dan Gelu Ignat and young winger Radeem Tlang replaced Rupert Nongrum. Shillong Lajong had a golden opportunity to take the lead in the opening minutes of the game. Lalruatthara's rash tackle brought down Aser Dipanda inside the box and referee was quick to award penalty to the visitors. Brazilian Forward, Fabio Pena took the shot but was denied by Albino Gomes's fabulous save. Shillong Lajong started out as the better team in the starting minutes of the game with Aizawl FC unable to have any shot at goal in the first quarter of the game. The Shillong Premier League Champions made mounted multiple attacks into Aizawl FC's half but were unable to get past Albino Gomes. In the 23rd minute, Dicka's sent a through ball to Issac on the right but his cross went straight into the hands of Aizawl's custodian. A minute later, Fabio Pena created a chance just outside the opposition's box but his shot went wide of the goal post. Aizawl FC started to get into a rhythm and the deadlock was broken two minutes into the half hour mark. Lalruatthara's cross from left was flicked by Alfred Jayran but Lajong's defence was unable to clear the ball and Ruatthara lobbed the ball into the nets. Two minutes later, Aizawl FC had a chance to double their lead. Mahmood Al Amna passed the ball to Albert Zohmingmawia who took the shot but it went wide after deflection from Lajong's defender, Chinglensana. Aizawl FC found confidence after taking the lead and made various inroads into Lajong's defence but failed to convert any and the match went into the Half Time with a 1-0 lead to the host. Minutes into the second half and Lajong had a chance for an equaliser. Dipanda's pass to the right was intercepted by Redeem Tlang whose cross was headed by Fabio Pena but went wide off the goal. Aizawl FC doubled their lead in the 63rd minute when Mahmood Al Amna dispossessed Nimdorjee Tamang near the halfline and dribbled towards the right flank and made an accurate pass to an unmarked Jayesh Rane inside the box. Rane's shot got deflected by Lajong's defender and rolled into the goal, mush to the dismay of Vishal Kaith. Lajong were awarded another penalty in the 85th minute when Eze Kingsley fouled Yuta Kinowaki inside the box. Kinowaki took the shot and converted from the spot to reduce the lead of the host. 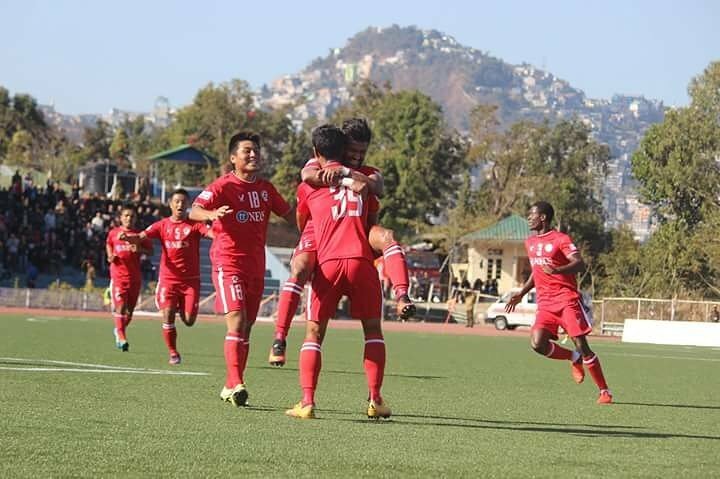 The Reds from Shillong were unable to get an equaliser in the dying moments of the match and succumbed to third straight loss in as many matches. Aizawl FC, on the other hand continue their dream run in Hero I-League and stretch their unbeaten run to three matches which includes two back to back wins and are at the top of the league table, albeit temporarily.